Nalbinding is a popular technique among reenactors, but despite many finds of needle suitable for nalbinding, the finds of nalbound Viking objects are very few, actually only three; a sock, two mittens and a pair of unique ‘pendants’. During later medieval times the number of nalbound mittens and socks is larger and there are a few caps too, but neither during prehistoric nor historic times have nalbinding been used for larger garments, like shawls or sweaters, in the way that knitting is used today. When we wrote the first issue of this booklet we only found datings of the Oslo mitten which were later than the Viking age. 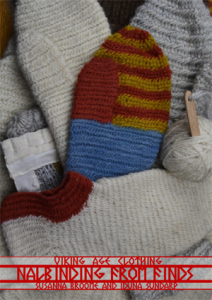 A visit to the Oslo Historical Museum and further research taught us that it was found among Viking age building remains and thereby within our historical period, so we have added the Oslo mitten to this new issue of the booklet. The following objects are described in the booklet about Nalbinding from Finds, which is a cooperation between my friend Iduna Sundarp and me. Se Bibliography for the complete bibliography. For resellers see Links. The only sock we know from the Viking areas during the Viking age is this one. It is from the 900’s, from Coppergate in York, England. The original is in quite good shape, but the construction of the heel is not completely certain. Our interpretation is one of a few that fit well with the find. The colours are from the find. The sock is nalbound in a simple, compact stitch in thin yarn. Our instruction make it possible to recreate the sock in a similar thin yarn (as in the picture), or in a thicker yarn, easier and faster to work with. The two yarns give the different difficulty levels 2 and 3. The largest difficulty is to make the stitches even. 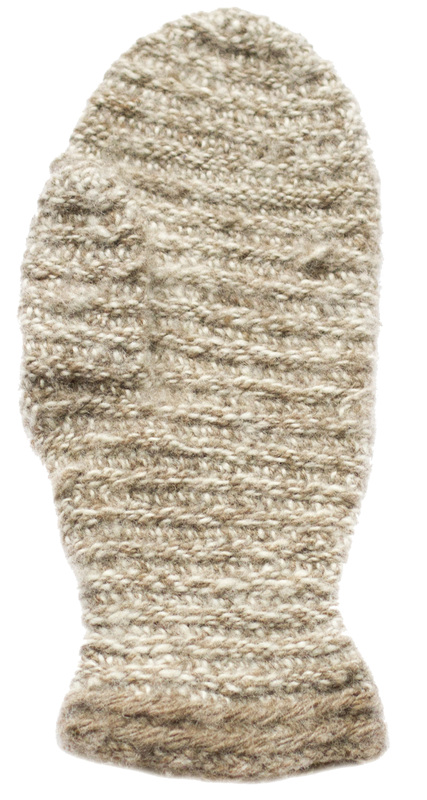 The first of the two mittens we know of from Viking areas during the Viking age is the Oslo mitten which was found among Viking age building remains in Oslo. 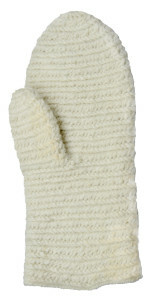 The mitten is simple and well used but also well kept and the shape is easy to reconstruct. The original looks more clumpsy, but that is probably caused by the use and wear. Interestingly, it showed that the mitten was not nalbound using the so called Oslo stitch, but with one of the stitches used in the Finnish mitten at the bottom of this page. The Oslo mitten has no colour remains and there is nothing that contradicts that such a simple garment was made in undyed wool. The only mitten with know from Viking areas during the Viking age is this one, found under an abandoned house foundation in Arneiðarstaðir in Iceland. Here too, the original is in good shape and the interpretation is secure. No clear colours are identified, but it seams like the two-ply yarn used had two tones. What is most insecure in this case is the date, 900’s, which is based on the dating of a ring needle found together with the mitten. Our interpretation is here made in a hand spun yarn made from very fine wool. The wool in the original looks more like the wool from Icelandic sheep with long guard hairs. We call this object a ‘pendant’ based on the shape, but it is part of a pair that may have been used as the ends of a stole, tapes on a cloak or ends of a girdel. The find is broken at the upper end of the nalbinding so the use is up to debate. This is a unique nalbound object. It comes from the grave in Mammen in Denmark and is dated to the 970’s. Our interpretation ends where the original ends, but is of course quite possible that it continued in the middle. We have used contemporary embroidery thread in yellow and white metal, but the original had real silver spund around a silk core and several thin real gold thread. The high difficulty level is totally based on the materials – to nalbind evenly and neatly in metal thread is much harder than to nalbind in thicker wool. The mitten from Eura is strictly speaking not from Viking areas, even if it is from the Viking age, but we just could not leave this wonderful Finnish mitten alone. In this case, the colours are well known, but the construction is very insecure. The find consists of a number of fragments found close to the hands at the front of a woman’s grave from the 11th Century. What is possible to deduce is that the colours were related to each other like in our interpretation and that it probably is a pair of mittens. Parts of the base of the thumb is preserved. The rest of the construction is inspired by the mitten from Iceland.